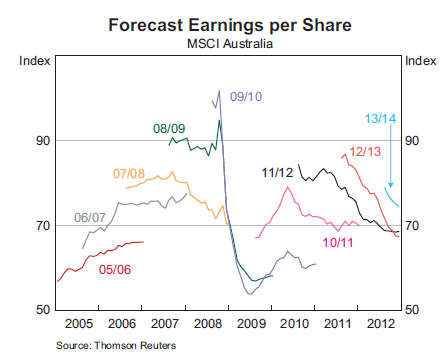 The RBA released its chart pack today and there are few charts I always like to look and in recent months its been the above, Forecast Earnings per Share. Its very difficult to see but the update to this chart shows a tiny movement sideways…so…its the first time for quite a few months that forecast earnings haven’t declined for 2012/13. Obviously the market rejoiced in this fact and ran up another 5%. Over the last 6 months, the Australian sharemarket has returned over 17% whilst forecast earnings decreased by almost the same margin….that should be one sizeable PE expansion of roughly 25% to 30%. The expected growth doesn’t quite justify this expansion so, at the risk of repeating myself, be careful when it comes to sharemarkets as they are possibly riskier than they currently appear and when the money printing stops so may the current momentum. Please note that this is not a sell recommendation by any stretch as this run could continue for some time, but once again its a warning to not get carried away or be fearful of getting in before missing out.